﻿﻿﻿﻿Thank you for your applause of my parents' gift of the Ruth Mulan Chu Chao Center, and the Ruth Mulan Chu and James Si-Cheng Chao Fellowship at HBS. I hope that you learn a little bit about the extraordinary lives my parents led, and the values-laden life that they lived and live. Their story is truly inspirational. 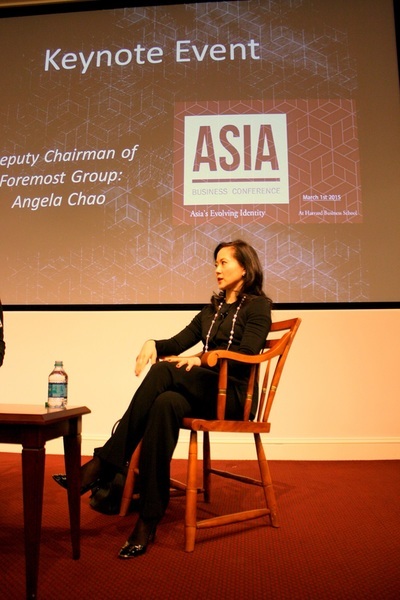 This year's Asia Business Conference, hosted by Harvard Business School, took place on March 1, 2015. Its theme was “Asia’s Evolving Identity” -- focusing on the topic of Asia’s cultural influence on entrepreneurship, industrial development, policymaking and legal advancement. •	Is there such a thing as Asian culture, and if so what does it look like? •	How are social and economic evolutions impacting Asian culture? •	What are the strategies that must be employed by leadership as they blend in and distinguish from the Asian influence? 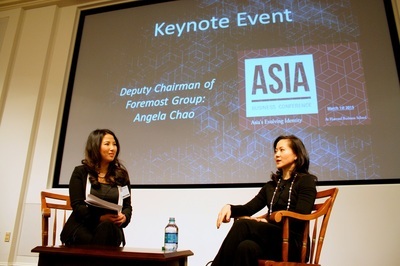 Angela Chao, Deputy Chairman of the Foremost Group, joined a distinguished list of keynote speakers at the Conference, including: Her Excellency Kobkarn Wattanavrangkul, CEO of Toshiba in Thailand and currently serving as Minister of Tourism and Sports in Thailand; Leiming Chen, Partner in the Hong Kong law firm of Simpson, Thacher & Bartlett; Lehut Binsar Panjaitan, founder of Toba Sejahtra Group and former Indonesian Minister of Trade and Industry. 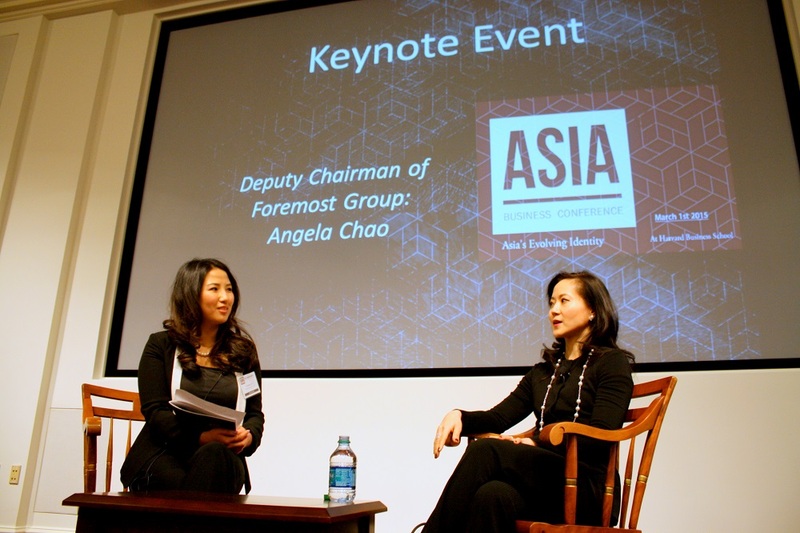 The Conference is organized by four Boston-based student organizations: the China Society at Harvard Kennedy School, Harvard Asia Law Society at Harvard Law School, the Chinese Students and Scholars Association at Harvard University Graduate School of Design, and the Asia Business Club at Harvard Business School. The Conference took place over a single, very packed day. Beginning early in the morning at 8:00 am with registration, the first keynote speaker was followed by two panel discussions, lunch, the next two keynote speakers, and several more panel discussions -- with the final keynote address and a networking social to close out the day at 7:30 pm. Despite having lived through epidemic, famine, civil war, foreign invasion, etc. my parents are amazingly optimistic and forward-looking people. My father made this beautiful gift to HBS, because he said he wanted to thank the school for educating so many of his daughters! That's the positive, always appreciative lens through which my parents see and experience the world.